Fundraising. Setting goals and surpassing them. These are just a few of the topics discussed at my dinner table. Yes, I know this is not your typical dinner conversation, but that is because my son is not your typical 11 year old. Being a conservationist is not the coolest thing for a 6th grader to be known for. However, Dylan takes pride in his efforts and I keep reminding him that he is doing great things. That's what moms do, right? We praise our children for a job well done. Sometimes the response I get is "You're just saying that because you're my mom" or "Most people don't care about what I'm doing to save the animals". As his mom, this breaks my heart to hear him think this way. He may be partially correct, the world is filled with all sorts of people who have their own beliefs ... but as Dylan recently found out, there are a whole bunch of people who think he's doing some pretty awesome things for wildlife conservation. Last Friday was Endangered Species Day and we were invited to take part in a special Rally4Rhinos event at the San Diego Zoo Safari Park to help bring more awareness to the plight of rhinos. Even though Mother Nature decided to give us lots and lots of rain this day, it was an event we wouldn't miss. The Rhino Rally kicked off with a "crash" mob of elementary students and teachers from the San Pasqual Valley and was followed by updates from San Diego Zoo Global and William C. Woody, Chief of Office of Law Enforcement at the US Fish & Wildlife Service. Imagine Dylan's surprise when Chief Woody asked Dylan and another young boy to come up to he podium. 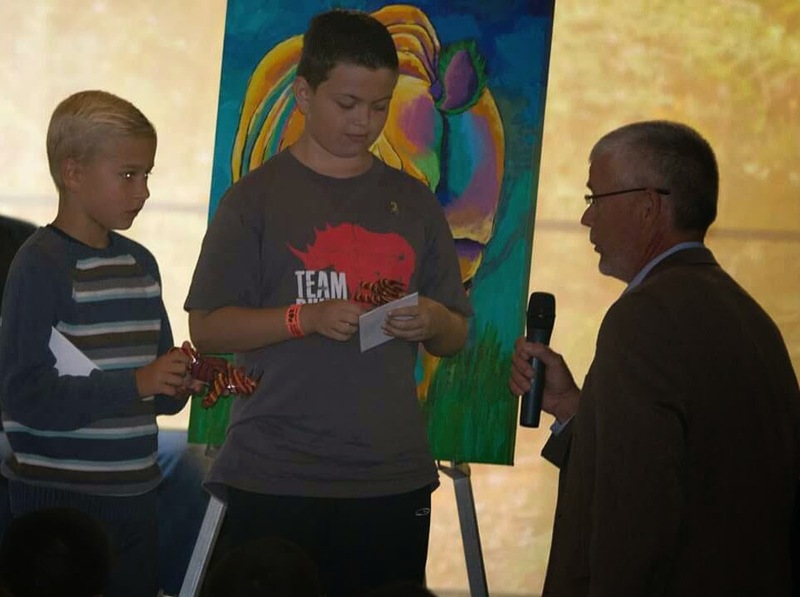 Both boys were recognized for their conservation efforts and for making a difference for rhinos and other endangered species. Hearing my son share what he has done and seeing the look of of pride on a friends face while he spoke was something I will always remember. The applause that filled the pavilion for Dylan when he was done speaking filled my heart with a kind of joy that I have never felt before. Not just pride as his mom, but pride for him getting the recognition he so desired and needed. As Dylan walked back to his seat, standing tall and clutching his rhino sculpture, I saw something in him that I haven't seen before. I saw confidence. The confidence of a young man was beaming from my pre-teen son's face. 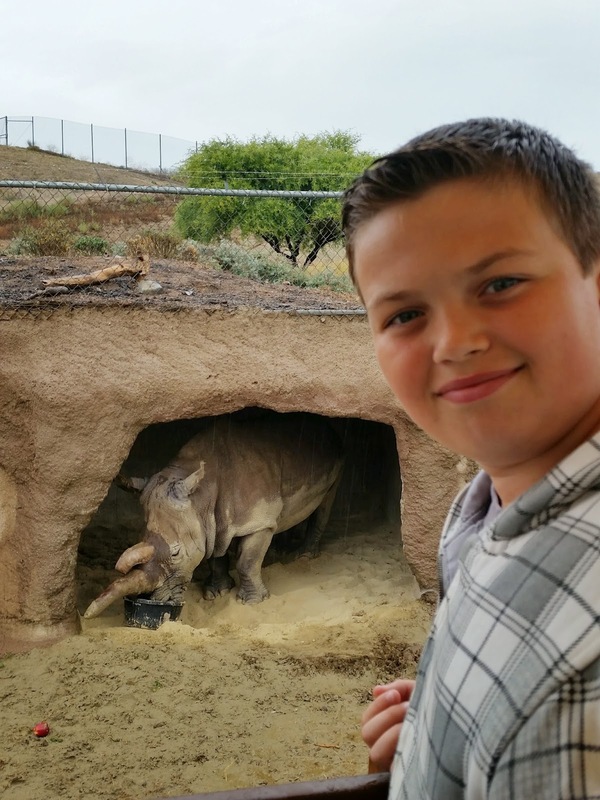 This public recognition from our friends at San Diego Zoo Global Wildlife Conservancy and from Chief Woody was just what Dylan needed to reaffirm his passion for conservation. As another way of saying thank you to the boys, we were invited to go out on a VIP caravan safari to see Nola, one of only five Northern white rhinos left in the world. Nola is our favorite rhino and truly one of the most beautiful creatures I have ever met. This was a dream come true for Dylan. I really don't think it matters anymore what the kids at school say because Dylan just had the best day of his young life.